It’s one thing for local cops in Miami to arrest you for simple possession of marijuana. It’s quite another when the DEA accuses you of participating in a drug trafficking conspiracy. Federal drug charges can land you in prison for years–if not decades–on a variety of charges beyond mere possession. Let’s consider a recent high-profile drug trafficking case from here in Miami. 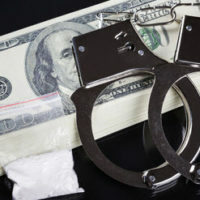 This particular case involves four men who were part of a group identified by federal prosecutors as the “Big Money Team,” which allegedly sold drugs throughout the Little Havana area. For purposes of this article, we’ll focus on just one of the four defendants. In November 2013, a Miami-Dade police officer initiated a traffic stop of a car driven by the defendant’s girlfriend. The defendant was seated in the front passenger seat. In the course of the stop, the officer said he smelled marijuana “wafting from the vehicle.” The officer also observed a gun underneath the passenger seat. The defendant then admitted he had a “bag of marijuana” on him. Another officer arrived and informed the defendant there was an outstanding warrant for his arrest. The officers then arrested the defendant. A federal grand jury indicted the defendant for, among other things, possession of a firearm by a convicted felon, possession with intent to distribute marijuana, and possession of a firearm in furtherance of a drug-trafficking crime. At trial, the defendant moved to exclude the gun as evidence on the grounds the police illegally searched his girlfriend’s car. He also challenged the admissibility of the statements he made to the Miami-Dade police officers following his initial arrest on state charges. The trial court denied these motions. A jury subsequently convicted the defendant on the above-cited charges, as well as additional offenses related to cocaine trafficking. Following a post-trial agreement with the prosecution, the defendant received a 30-year prison sentence. The defendant still appealed the trial court’s refusal to exclude the gun and his statements to police. But the U.S. 11th Circuit Court of Appeals rejected the defendant’s arguments and upheld his conviction. With respect to the first issue, the appeals court said the defendant “lacked standing to challenge the search because he lacked a reasonable expectation of privacy in the car,” and in any case, the officers were “entitled” to conduct a search. As for the defendant’s statement to police, he “initiated the conversation” even after the police advised him of his rights, so his challenge was meritless. If there’s one key takeaway from this case, it’s this: Never voluntarily speak to the police without first contacting a lawyer. Especially when dealing with potential federal drug trafficking and firearms charges, you can be assured that anything you say will be used against you. If you need advice or assistance from a qualified Miami criminal defense attorney, contact the Law Office of Julia Kefalinos today.